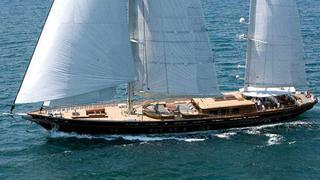 News from Burgess that they've now listed the 47m sailing yacht Roxane for sale. Built to RINA class by Turkey's Su Marine in 2010 as a sailing ketch, she was constructed in cold-moulded Iroko wood and African mahogany and was a finalist in the 2011 World Superyacht Awards. An interior by Remi Tessier in neutral colours sleeps nine guests in a master suite, VIP stateroom and a double and twin cabin, plus a Pullman berth. Twin 600hp Scania engines give her a cruising speed under power of 11 knots. Lying in San Remo, Italy, Roxane is asking €7.5 million.